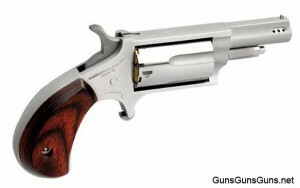 Summary: The description, specs, photos, pricing and user ratings for the NAA .22 Magnum Mini-Revolver Ported revolvers. The North American Arms (NAA) .22 Magnum Mini-Revolver Ported is a subcompact revolver designed for up front, personal, close-in protection. It’s small, easy to conceal and safe to carry. Two barrel lengths are available (1.625″ and 1.125″), and the barrels are ported to reduce felt recoil. NAA says the .22 Magnum can be used with all popular .22 Magnum ammunition, including .22 Magnum shot shells (called Snake Shot by some manufacturers). 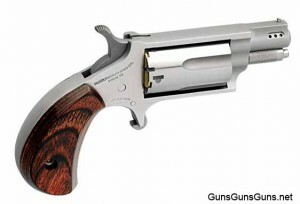 NAA also offers a .22 Conversion Cylinder for its .22 Magnum Mini-Revolver. The Conversion Cylinder is a special, longer .22 LR cylinder that will fit in your .22 Magnum Mini-Revolver. This entry was posted in .22 WMR, $25-$250, $251-$500, North American Arms, Revolver, Subcompact on October 24, 2012 by Staff.